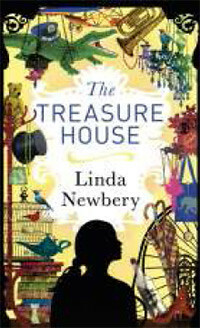 Linda Newbery’s new book is a tribute to charity shops everywhere. She is such a ‘green’ person, that it’s hardly surprising to find The Treasure House full of ideas for upcycling. I am now wanting to upcycle my whole life. At least my wardrobe, and far more than I’m used to doing. In fact, I came away from reading so full of ideas for clothes and behaving greenly, that I almost forgot what The Treasure House is also about. It’s actually almost a little Hollywood-ish. Not that it couldn’t happen, but I did find the behaviour of 11-year-old Nina’s parents rather strange. On the eve of Nina starting Big School, her mother disappears off with barely any notice. And when Nina finds some of her Mum’s stuff in the charity shop, she gets worried. Her Dad then sets off on a countrywide search, leaving Nina to stay with his aunts Rose and Nell, the owners of the charity shop. Big School is difficult, but Nina makes one friend, and that’s what leads to this upcycling business. While trying to work out where her Mum could have gone, and why, she and her new friend work on a clothes show and make discoveries about other people in the village. It’s a fun story, set in lovely surroundings, and quite romantic as well as courageous in several ways. As for me, I will need to get things down from the attic to begin with. Just thought I’d get that out of the way before proceeding to tell you about a book which chronicles weird things customers in bookshops say. Maybe I have said such things myself, but if I did, I don’t remember. And I didn’t mean to. 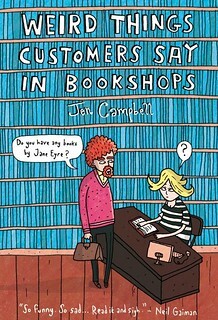 Jen (not a name that appeals to everyone) Campbell has worked in several bookshops and she had the presence of mind to take notes whenever customers talked to her. They invariably said strange things. Anyway, Weird Things Customers Say In Bookshops is here, and it’s good for quite a few laughs. I shouldn’t quote really, as there is a risk I will simply reproduce the whole book here if I do. It’s been nicely illustrated by the Brothers McLeod. I don’t know them, but they have capably shown us the girl who wants to grow up to be a bumblebee, and other amusing bookshop situations. It seems every bookshop Jen has worked in has a bookshop dog. Her current one lives in the middle of the shop floor and refuses to move. So I’ll just fall and make that a flat dog then. Or expired dog. I gather there is a Monty Python connection. But I do feel for the customer who took the day off work in preparation for reading the last instalment of Twilight, only to find the shop didn’t have it. Good taste, but bad luck. There are killer books and edible books. Maybe. But very few signed by Shakespeare. Jane Eyre wrote good books and it is a shame Anne Frank never wrote a sequel. While I wait for better service, I will just lie down here on the shop’s sofa for a little snooze. We are all very much for equality here at Bookwitch Towers, as long as people remember I’m a little bit more equal than some. But I was really taken aback when I read the shortlist for the 2012 Queen of Teen. I somehow expected this shiny tiara institution to be a smidgen more traditional than I am. It’s not. This year we could have a Queen James. Now, trailblazing James Dawson is up against the Cathys, Cassidy and Hopkins, longterm princess Joanna Nadin, as well as Hayley Long, Maureen Johnson, Chris Higgins, Samantha Mackintosh, Sarah Webb and S C Ransom, so might not reach his queenhood. But it’s an intriguing situation, even for an egalitarian old witch. And because I am presently almost doing my blogging from the bathroom floor, I will leave you with the dog who does his writing on the roof. Today’s post could have been longer, I know. It could also have been no post at all. Somewhere in my murky past I was a sailor. There was blood involved, although not in the way you might think. The reason I’m bringing this up now is the cross-language working environment, as recently seen in The Bridge. As was mentioned in my paper, when it was shown in Scandinavia people also needed subtitles. Half subtitles, for when the actors spoke the ‘other’ language. In theory you shouldn’t need them, but in reality of course you do. And I’ll let you in on a secret. The only reason those actors seem to do so well is that they are speaking lines. Someone else script-wrote their replies to what that Dane/Swede said to them and they didn’t need to understand a single thing. Now, many of us, including the young Seawitch, do/did work with speakers of the other language, under conditions that allow no instant kind of subtitling. It’s fun. Challenging. Often incomprehensible. You get more used to it after a while. All together now; say ‘remoulade’ as though you really mean it. Try to sound a little more Danish, would you? We’ll be moving on to more advanced stuff any minute now. Rødgrød med fløde. That tastes far nicer than the easier to say koldskål. The latter looks very tasty, but at least in the crew mess on Europafärjan III it didn’t do much for my tastebuds. Try being shut into a walk-in fridge with a Danish chef, and see how you like it. Sleep in a cabin with a Danish cleaner who smuggles cigarettes in her bra. We never did feel entirely certain what she said as she talked to us, the three Swedish washer-uppers. Quite likely she didn’t understand us either. One of my tasks – other than not being sick while operating the dishwasher – was to serve the lorry drivers their lunch. This involved going to the galley and asking the Danish chef what was on the menu. You had to try and keep that in your head for long enough to be able to repeat it in the cafeteria, making it sound roughly the same as it did before. Lorry drivers were invariably Danish. Not sure why. And because they were regulars, they got special treatment. I forget where I picked up this particular piece of wisdom, but apparently there used to be a Danish saying along the lines of ‘do your good deed for the day, and accompany a Swede to the ferry.’ I am guessing these days you take them to the bridge and make sure they are just past the middle. All of them. Not just the upper or lower half. 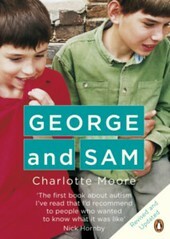 I can’t believe that I never reviewed Charlotte Moore’s book George and Sam, about her two autistic sons. 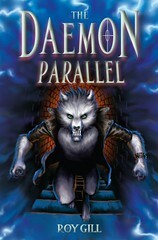 It meant so much to me and I was one of the first to buy it the minute it was published, back in 2004. It has just been re-issued in paperback, and with the added and very great bonus of the columns Charlotte wrote for the Guardian for two years, before the book was published. I used to live for those columns. They were in the paper fortnightly, and I would have happily read one every week. Every day. Seeing the photo of Charlotte and knowing it was another Mind the Gap day meant so much to me. Until then, I had no idea anyone could write so intelligently about autism, while also being amusing. The new version of George and Sam has the same cover photo of the boys, from when they were about twelve or thirteen. They are adults now, of course, but will never live like normal adults. What’s so fantastic about Charlotte and her neurotypical youngest son Jake is the way they feel this is normal. Because to them it is. The addition of 100 pages of Mind the Gap is like revisiting a favourite childhood place. I didn’t remember this, but the column began on my birthday, eleven years ago. And for me it was precisely the right year for it to begin. I am of the opinion that you could easily re-read this book and the Guardian columns many, many times. It’s like coming home and feeling safe. 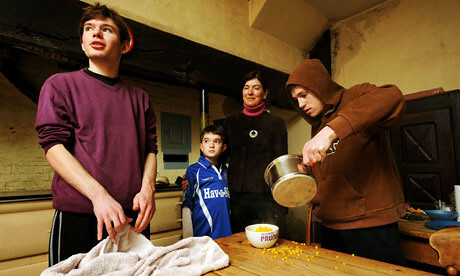 * And I’d forgotten the introduction by Nick Hornby, who knows what it’s like to live with autism. I can’t be the only one who feels like a changed person for having read about Charlotte’s daily life with her boys. Whether or not you live with someone on the autistic spectrum, read about George and Sam and your life may improve. *I recently had a request from a reader of this blog for a friend to be put in touch with Charlotte. I can fully sympathise with that kind of feeling. As long as we don’t all do it. 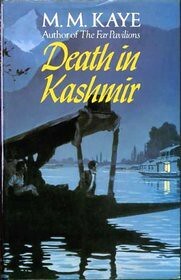 That day, when I began pulling ‘Indian’ books from my shelves, to re-visit or to read for the first time, I was rather alarmed to find that the first book my hand encountered was Death in Kashmir by M M Kaye. I looked at it, and hoped it wouldn’t be. Then I stashed it away for the time being. That means I’ve not even attempted to re-read, speedily or otherwise, either the Kashmir based romantic thriller, or the one called Death in the Andamans. The strange thing is I remember virtually nothing about them, so could obviously re-read as though they were new. Not so much should I want to, but if I ever have time. I suspect that back in the olden days, I was simply less interested in this part of the world. Zanzibar was romantic and Cyprus was my favourite. Kenya was OK, and Berlin seemed a little on the grey side. I won’t have realised that India was M M’s own country, rather than just another exotic place she had picked to write about. This time round I found the author’s notes the most enlightening, and it seems the Kashmir book was delayed considerably while she met her husband-to-be, married him, had their children and moved around a lot. It’s very romantic, that M M went from 2000 words a day, to nothing. And less romantic that she began writing again because they were poor and needed the money. If I put them all together, I’m sure my readers have been everywhere in the world. Needless to say I ‘spoke’ to one this week who visited Kashmir while it was ‘open for business.’ Probably would have sent me a postcard, too, if we’d known each other back then. Postcards have been thin on the ground this time. But, there is always facebook, so I have to make do with that. 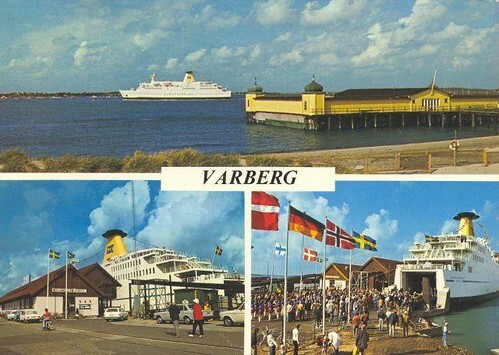 And perhaps the postcard is in the post.